These garden grazers can eat over six pounds of food a day. Unfortunately, all that snacking and trampling through the yard can damage fruit trees, vegetables, and flowers. Here's what you need to know to find a deer deterrent that really works! 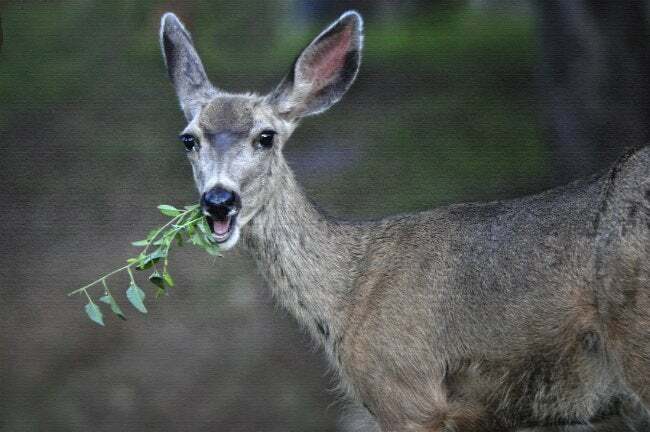 You might enjoy their pastoral presence, but there’s no doubt that deer wreak havoc on garden vegetables, plants, and trees. Here are some ways to keep them from snacking on your lawn and garden. First, deer love fruit trees, ivy, and high-protein crops like peas and beans, so remove those from your garden if you can. Consider planting prickly bushes to create a barrier around the perimeter of your yard. If you’re really determined, you can always install an opaque fence—but remember that most deer can scale a six foot barrier in seconds. To be effective, it should be at least eight feet tall. Another option is to install a lower fence topped with chicken wire and tilted away from your yard at a 45 degree angle. For a less hands-on solution, try motion-sensor lights or an automated sprinkler system to startle the sneaky intruders. It might sound strange, but chili spray, bits of human hair, or repellents containing wolf or coyote urine can also do the trick. Most of all, experiment with new methods if the problem persists. Every person, like every deer, is different—so what doesn’t work for one may be the perfect deterrent for another.